Join us for a special Gallery Relations 101 hosted by Arnika Dawkins of Arnika Dawkins Gallery and Tony Casadonte of Lumiere Gallery. In this two-part workshop, Dawkins and Casadonte will candidly speak on topics such as approaching galleries, developing relationships and networking, and professionally presenting your work. Following this discussion, each artist will have the opportunity to meet with Dawkins or Casadonte for a 15-minute portfolio review session. This workshop will take place at Arnika Dawkins Gallery. Arnika Dawkins is the owner of her eponymous fine art photography gallery established in Atlanta in 2011. The gallerist shows work by talented emerging and mid-career artist with a specialization in showing fine art photography by African Americans and images of African Americans. Her passion is connecting collectors to photography that is significant, inspiring and provocative. As a fine art photographer and avid collector herself, she is a valuable resource to collectors and artists alike. She is passionate about the medium having obtained a Master of Arts in Digital Photography from the Savannah College of Art and Design. Tony Casadonte has had a diverse, thirty year career in photography. After graduation from Rochester Institute of Technology, his early career concentrated on photo-illustration, video, computer graphics and management of commercial photographic laboratory operations. As a partner in a interactive design firm, he pursued the application of on-line technology to photography. 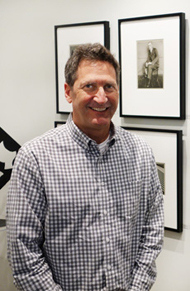 For the past 12 years he has been gallery director at Lumière, where he has taken this background to help shape the gallery programming and web site experience.